Savoy Cabbage Marries Strawberries, With Barley as Best Man and Basil as Maid of Honor. Photo by Simona Carini. Fresh market strawberries. Photo by Simona Carini. Arriving at the Arcata Farmers' Market on graduation Saturday, I must confess that my thoughts were not directed at cheering students, but at cheerful strawberries. I had a feeling they would be there and my feeling was correct. I believe the look in my eyes must have been particularly spirited, prompting the smiling young woman who helped me empty two baskets of strawberries in a bag to ask me what my plans for their use were. Please, allow me to step back for a second to my childhood. 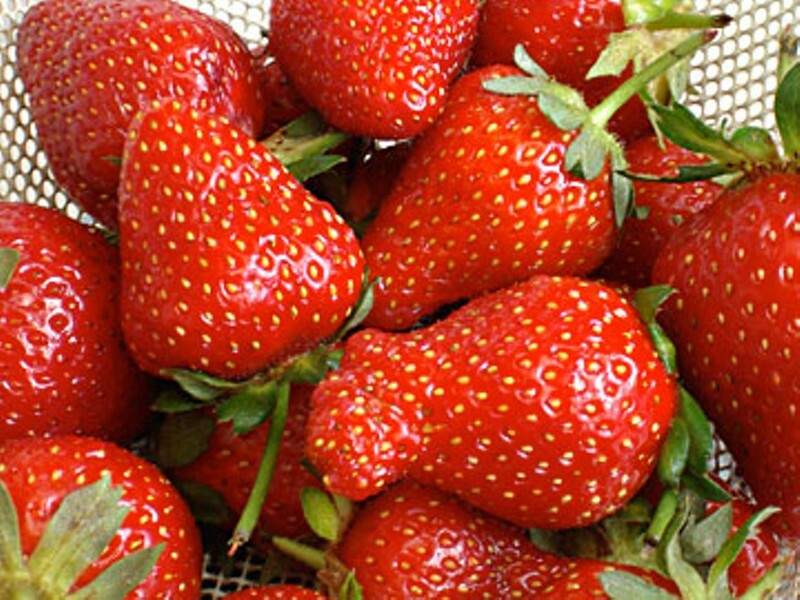 Back then, I welcomed strawberry season with the same excitement I manifested at the market. My mother's established recipe involves slicing the strawberries, adding to them a bit of sugar, then letting them rest for a few hours. My brother and I were assigned the task of walking to our favorite gelateria (ice cream store) and buying fresh whipped cream to top the strawberries. I always left some of the whipped cream at the end to go with the ruby juice that veiled the bottom of the dessert bowl. I think this is a great way to serve strawberries and I can imagine children (and adults too) smiling at their bowl of cream-capped strawberries today as my brother and I did then. The plentiful availability of strawberries in California has inspired me to use them in sweet preparations, like mousse, ice cream and sorbet. This strawberry season, I am inclined to explore savory possibilities and previously untasted pairings. My first attempt at matching strawberries with a savory partner was not quite right. I am saying th at experiments in my kitchen always have a positive outcome. Results run the gamut from black failure to white success, with many shades of gray in between. Although I get upset when my efforts do not give rise to a satisfactory product, I try to look at what happened with a rational perspective and consider it part of the data gathering process. Basically, I wish to learn what did not work and use that information to guide my next step, which will then bring me to a much happier destination, like the one I am about to describe. The dish has four elements: strawberries, Savoy cabbage, basil and hull-less barley. Starting from the tail of the list, hull-less barley is a type of barley where the outer hull adheres loosely to the kernel and usually falls off during harvest operations. Bran and germ are preserved, making this kind of barley a nutritious choice. Additionally, the texture is chewier and the flavor stronger than with the more common pearl barley. The downside is a longer cooking time, which can be reduced with a few hours of sojourn in a bowl of water (aka soaking). In a previous column ("Table Talk," April 10) I discussed the locally grown hull-less barley now available at the Farmers' Market. I've used it to create a soul-warming soup/stew hybrid with various combinations of vegetables. Sunny days, however, shifted my thoughts from warm to cool foods, and I decided to add barley to the present dish. What would summer be without basil? I prefer not to meditate on such a sad option, and make sure I always have some at the ready. Crinkly-leafed Savoy cabbage has a milder flavor than green cabbage. I love shredding it, because the crinkles make the leaves soft, pleasant to cut. I have already presented the prime inspiration for the dish, strawberries, so we are almost ready to go. Let me just introduce briefly the indispensable supporting cast. Contributing flavor to the main ingredients are shallots and thyme, lemon thyme being my preference. I recommend planting some if you can. Thyme is a great addition to so many dishes that a steady supply has become a requirement for me. The evening before you plan to prepare the dish, rinse thoroughly half a cup of hull-less barley, removing any debris, and put it in a bowl with two cups of water. The morning after, change the water and keep the barley on standby until ready to cook. Making the dish a few hours ahead of the planned eating time will allow for a period of cooling off and then of flavor blending. When the appointed cooking time arrives, rinse the barley one last time and place it in a small saucepan with a cup and a quarter of water and a bay leaf, bring to a boil, and simmer for 40 minutes. As mentioned above, whole-grain barley has a characteristic chewy texture: Take this into account when tasting it for readiness. In case of a shorter soaking time, you may need to cook the barley longer. In the meantime, generously coat a large pan with olive oil (possibly using a nebulizer) and warm it over medium-low heat. Add two ounces of shallots, finely chopped, and a teaspoon of thyme leaves. Turn the heat down to low and cook five minutes. Shred a pound of Savoy cabbage and add it to the shallots, together with a quarter cup of water. Cover the pan and cook until tender, about 20 minutes, checking periodically that there is still moisture in the pan. (Add a tablespoon or two of water, if the pan becomes dry.) While barley and cabbage are cooking, wash and hull half a pound of strawberries and dice them small. I cut each strawberry in half lengthwise, then cut each half into five to six slices again lengthwise, then five to six slices crosswise to make a sort of grid (each slice is about 1/8" thick). Place the diced strawberry into a bowl; add a teaspoon of balsamic vinegar and stir. Stir again a couple of times at 15 minute intervals. Let the tender Savoy cabbage cool slightly, then add 16 leaves of finely slivered basil. Stir to distribute. When the barley is ready, drain excess liquid and let the grain cool. An hour or so before mealtime, assemble the dish by combining everything, strawberries, barley, Savoy cabbage and basil, in a serving bowl. Add salt to taste, a tablespoons of olive oil, a quarter cup of plain yogurt (without gelatin, I use non-fat), eight more leaves of basil, finely slivered, and a little bit of freshly ground black pepper. Stir well and let rest in the fridge. Take the bowl out of the fridge at least 15 minutes before serving "Savoy cabbage married to Strawberries, with Barley as best man and Basil as maid of honor" as a side dish. If you have been thinking that this wedding party dish would make a nice filling for cold spring rolls, you are correct. Soften a sheet of rice paper in an inch of warm water, drain and spread on a working surface. Place one third of a cup of wedded mixture on the bottom third portion of the wrap, fold the bottom flap, then the left and the right one, then roll towards the top. I tend to view a recipe as a point of departure: Someone passes it along to you, and you run with it in whichever direction your imagination brings you. Wherever you go with this one, have fun! Cook shallots and thyme leaves in olive oil on low heat for 5 minutes. Add Savoy cabbage and 1/4 cup of water. Wash hull and dice strawberries, add balsamic vinegar and stir. When Savoy cabbage is cooled slightly, add 16 leaves of basil chiffonade. Drain barley and let cool. 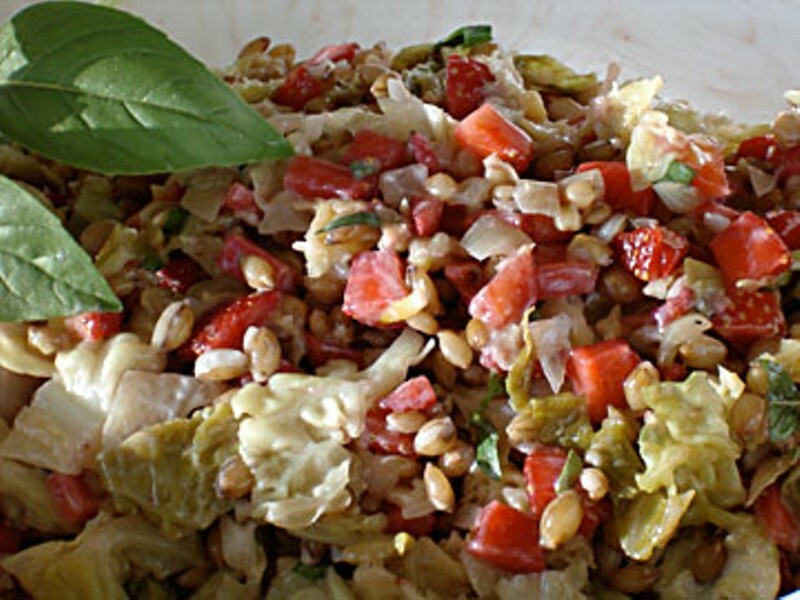 An hour ahead of serving, assemble the dish by placing cabbage, basil, strawberries and barley in a serving bowl. Remove from the fridge at least 15 minutes before serving as a side dish.